With labels on demand or print as needed options, direct thermal labels and thermal transfer labels are efficient, cost effective solutions. 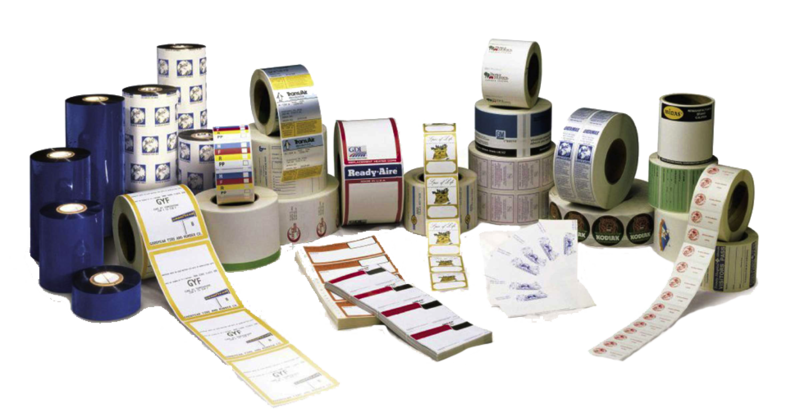 We at Davis Print & Packaging offer a vast array of blank roll labels designed for all types of print needs. These labels can be die cut to any custom size, in quantities from the hundreds to the thousands. Our Experts will listen to your application and recommend the right stock labels, or help with developing a custom roll. Unlike many suppliers, we offer an expansive cross-section of high-quality ribbons made by some of the most trusted companies in the label industry. We thoroughly test our ribbons to assure consistent, reliable performance to meet application requirements. See which ribbon prints best with each material, along with common applications. Commonly used for shipping labels, receipts, name tags, picking and event tickets, direct thermal labels do not require ink, toner or a transfer ribbon. The label has a special heat-activated layer where a black print image is formed on the label as heat from the print head is applied. Eliminating the ribbon makes for easier use and a lower cost per label, but not without sacrificing durability. Direct thermal labels are not recommended for demanding condition, such as outdoors. For our full selection of blank thermal transfer labels on rolls, visit our shop.